Your exhibition Beyond Horizons is a compilation of your works over four deca­des. How much has your style changed over time? It has a watercolour since I was 12! Till 1990, I did mostly landscapes; it slowly became more figurative. Now it is dominated by the figure. Lately, I’ve delved into mixed media and begun sculpture. You work with various mediums. How do you choose one? I pick and choose by mood, and what I want to convey. Landscapes work best in watercolours. You were awarded the Padma Shri quite early. It means a lot more responsibility; one feels responsible to make better art. 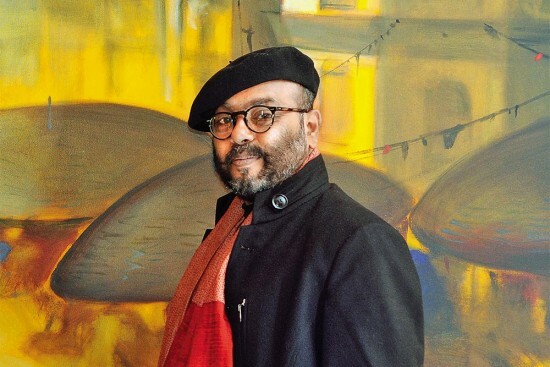 How do you bring a contemporaneity to artwork from rural Bengal? I absorb the uniqueness of rural art; depict it in my style. I start with no preconceived ideas. I play with colour and figures emerge, both with painting and sculpture. While many artists are making ‘daring’ art, one hasn’t seen it in India. We have a 5,000-year-old art history, and it reflects in our art, making it uniquely global. Watercolour, a medium you are most comfortable with, is not widely preferred. Coming from a poor family, I worked with paper and cheap water tubes. It is challenging, but the urge to paint made me take up watercolours. You are known for you bold, flamboyant style. Who inspires you? Picasso has been an inspiration. Also, folk art. Tell us about your ‘artists in residence’ programme at Rashtrapati Bhavan. It takes a lot of grounding to understand that art is mainly an emotional investment.